The Surface RT tablet sure looks like an appealing gadget to own but the price might be a drawback, even if it’s not more expensive than it’s counterparts. That’s why, any offer, deal that we can get is a cheaper blessing, because it decreases the overall pricing of the device. Many of us need a tablet keyboard for increased productivity, and with the Surface RT, things are just the same. But if you’re looking to get a Touch Cover for your Surface RT, then you should that it comes at the $120 price (that’s in the United States). 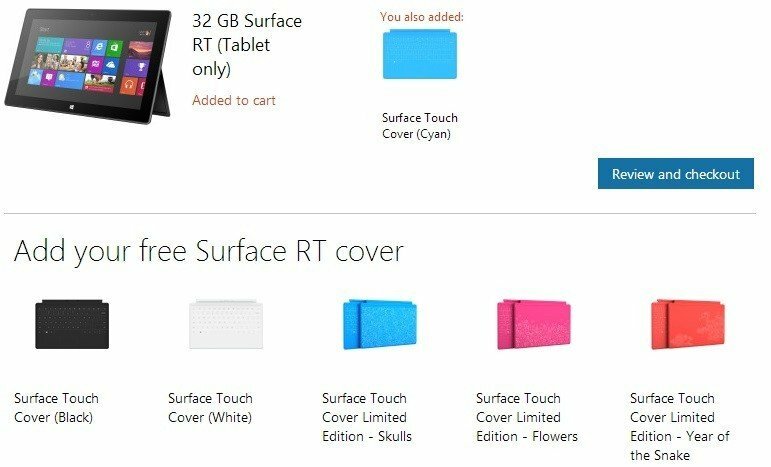 Those residing in the United Kingdom and looking to buy the Surface RT have now another reason – you will get a free Touch or Type Cover with your purchase. So, you should really hurry up as it also might have limited availability. What’s really awesome is that the limited editions of Touch and Type Covers are also included, as you can see in the image from above. You don’t need to add any promo codes at all, you just need to finalize the shopping.